Summon: Draw a random multi-attribute card from your deck. Silent Pilgrim is a rare Neutral creature card. It is part of the Houses of Morrowind expansion. In addition to the card's availability in the Houses of Morrowind expansion, one copy is included in the Hlaalu Schemes theme deck. 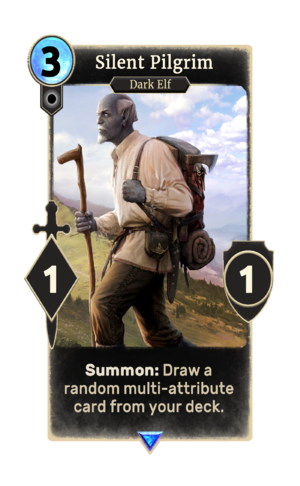 This card is likely a reference to the Silent Pilgrimage quest in Morrowind. This page was last modified on 2 March 2019, at 00:53.